You are here: Home / Ethnic Groups / The People of Sulawesi / Who are the Mandar? The Mandar (or Andian) people live in the low coastal plains and mountains of the province of West Sulawesi. 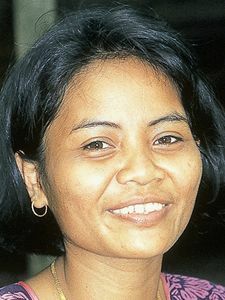 The Mandar have been greatly influenced by the larger neighboring Bugis, Makassar, and Toraja Sa’dan peoples. The Mandar region is surrounded by mountains with a large area in the middle suitable for rice fields. Their main sea products are the cakalang fish and turtle. They speak the language of Mandar, which has at least 5 dialects. The Mandar language is part of a larger language group called the Nothern South Sulawesi family. This group includes the Mamuju, Pitu Uluna Salu, and Toraja Sa’dan languages. Many Mandar live by farming rice fields or orchards while some work as fishermen. In the Sendana and Malunda areas, their produce includes copra (dried coconut meat) and cocoa. The rice fields of Polmas are irrigated, while other regencies still use the traditional means of depending on rainfall. As a society that used to be an independent kingdom, the Mandar people recognize three social classes. The high class consists of the nobility, the middle class is the commoners, and the lowest class is the slave class. The nobility are referred to as Daeng and the Puang are the commoners. Currently, the king does not rule by hereditary right. He is chosen by the traditional leaders. In the Mandar tradition, if the headdress of the community leaders is worn angling to the left, the king must reconsider his leadership and policies. If the elders come and walk in front of the palace while wearing their headdress angling to the left and also carrying spears and keris (sacred knives), this is a sign for the king to step down from his throne voluntarily. If the king does not step down voluntarily, then they will try to depose him with force (even to the point of killing him). If they are not able to accomplish this by force, then many of them will leave their villages. In the Mandar viewpoint, a king is regarded as a bad king if the people leave in this manner. The Mandar people are Muslims. At the same time, traditional animistic beliefs are still strong in the daily life. They still believe in the power of unseen spirits that inhabit sacred places. The services of a dukun (shaman/healer) are often sought for many purposes, including healing the sick and casting out spirits. The Mandar need assistance in management of their commercial agricultural enterprises so that they can obtain a maximum yield. They need help to professionally market their sea products to obtain the highest market values.